Off with the old and in with the new was the theme of this past week leading in to New Years. One of the things that came “off” was my cyclo cross knobby tires left from cross season.. I have been commuting on until they were completely worn out and finally last week the knobs in the center strip on the rear tire disappeared and with it I quickly received a flat. With this I decided to put more commuter friendly tires for the winter months. The tires that went on are Bontrager Race Lite Hard Case 700x32c tires. I am having a hard time finding them on their website as they are tires that were pulled off of a Trek 7.3FX series bike. Since installing the tires 24 hours ago I have about 30 miles on them with my commute today.. The ride into work went much quicker with out the knobs on my tires and a bit rougher with the hard case tires inflated up to 80 lbs compared to my 50lbs I run in the cyclo cross tires.. Speed and less likely to get a pinch flat is why I decided to up the pressure. Plus I am slowly going to let out pressure until I feel like I am at that tipping point of comfort and safety.. Some hard case tires do not do well at low air pressure as they are not supple enough to corner and not roll the tire off the rim. The 700×32 with was out of necessity. It was the largest commuter tire we stock at work that had a thicker rubber for flat protection. I much would of preferred a 700×38 or so. More volume the better when riding at night in my mind. I will be posting a longer time review once I get a couple hundred miles under my belt in the next week or two but my intial reaction is good. They preformed well in sharp, fast corners and swallowed some of the bumps on the side of the road riding home. I run these in 700×25 on my Trek 1200 for commuting. Mine lasted 3,000 miles and only suffered one puncture the entire time, and it was a GNARLY one that would have taken out any tire, liners included. The mode of final doom on mine was that the thick rubber middle section wore down paper thin and finally started separating from the wire and kevlar carcass in a few different spots. That’s exactly how a tire should fail, in my opinion. It was still holding air just fine, but I had to replace it because within a hundred miles or so I’d end up riding directly on mesh and kevlar, not rubber. I did have one problem in the summer. After a long, fast descent coming off a viaduct, I had to make a really hard, fast corner in order to stay with traffic to make a left-turn light that was going to turn yellow soon. The softer rubber shoulders on scorching hot pavement just wouldn’t grab. My front tire washed out, and I couldn’t get stopped either. I ended up running directly into a 4″ curb at about 15 MPH. I was out of the saddle, and didn’t endo. I was expecting a mess of broken spokes, tacoed rims and pinch flats. The only damage was a flat-spot on the rear tire from locking it up, and a slight bit of rim damage on the rear, easily trued with a spoke wrench. Lessons learned: Bonti Hard-Case takes a SERIOUS beating but doesn’t handle like a good racing tire so don’t ride it like it’s a racing bike. Also, don’t hammer to ridiculous speeds just to stick with traffic to make a stop light. It’s not worth the hassle. Looking forward to your review of the wider, lower-pressure hard-case tires. I could only wish I could fit tires that wide on my bike. Like Noah, I have these on my Trek 1200c, and am VERY happy with them. The first set was the 28 flavor, and lasted about 3000 miles or more, failing in the same manner as Noah described. They never had a flat the entire time. When it was time to replace them, I looked into several options, almost deciding on the Specialized Armadillos, but read reviews about people having “only” a few flats with those. So I decided to go with what I’d had such good experience with. I went with 23s this time, hoping for some more speed, but have not noticed a difference. I keep them pumped all the way up to 120 though. I hope that you have as good experience as I have had. Hey that’s mine! 🙂 I have a Trek 7.3FX and have been pretty happy with it as an all-around ride. My “all-around” is pretty limited, though, as I don’t do cross-country grueling-type rides. I use it as my main source of transportation (don’t have a car) around town, supplementing with public transit when necessary … namely, getting over the West Hills of Portland, OR. I’ve ridden it probably a max of 60 miles at a stretch and it has held up well and been comfortable enough for me. Mostly I use it for running errands, trips to the grocery store, etc. If I were the type to do a ride to the coast or more serious climbing, I’d probably want a real road bike, but I this one suits me just fine. Those tires have been good to me, once I got them lined with Mr Tuffy Tyre liner. 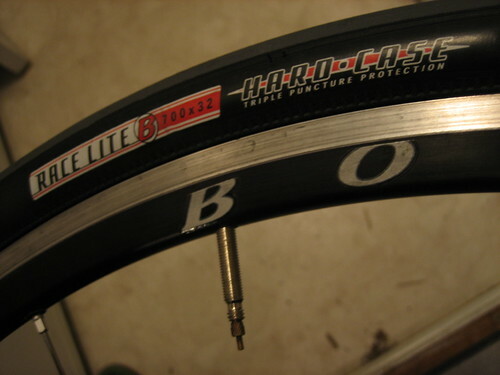 I had two flats in six weeks prior to getting them lined, and none in the 1+ year since. I keep them at about 90-100lbs. I just rode over a lot of gravel and some debris resulting from our recent Snowpocalypse with no issues. Got these on my Trek 520 in Feb ’09. These tires roll well, and are really quite bullet proof. After 1200 miles of commuting through town a bit of tread delamination started to occur on my front tire and at 1350 miles I got my first flat, a piece of wire. While repairing the flat I discovered some damage that appeared to have been a nail that penetrated the tread but was deflected by the armored casing, traveled up and out about half way up the sidewall, ripping out as it cam around. I remember hearing the event earlier on that ride. Upon further inspection of both tires they appeared to have been through hell and back! A continuous series of cuts and punctures on both treads indicate that I had been spared many flats in the past 5 or 6 months. Alas, I decided to replace them. The delamination of the tread up front and the sidewall rip on the rear, not to mention the 100+ other cuts, gouges and punctures on the tread and sidewalls made me less than confident of the future of these tires, so I replaced them. These are very tough tires. They may have only lasted 1350 miles prior to replacement but they took an incredible amount of abuse and if I wasn’t depending them as commuter tires I would ride them for as long as they held air! Just plumped for some of these in a 32 over the much more expensive Schwalbe Marathon Supremes. I hope I made the right choice! They are great tires, plus with Bontragers new “tire guarantee” you can try them for 60 days. If you hate them, return them!